"The King!" 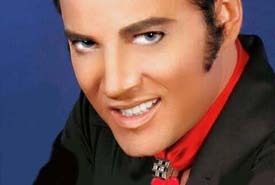 Starring TRENT CARLINI, Legendary ELVIS PRESLEY Impersonator, is taking his show "THE KING," on the road! TRENT has a 25-YEAR royal residency on the LAS VEGAS STRIP! Management: RICK WHITE, VP of Marketing and Entertainment for the legendary Las Vegas Hilton Resort & Casino/ (2004 - 2015) Bio upon request. TRENT WON! 2007 ABC Reality Competition Series, "The Next Best Thing: Who is the Greatest celebrity Impersonator?" TRENT CARLINI is more than just a world-renowned ELVIS Tribute Artist. He has put the stamp of approval on the three decades that ELVIS ruled the world of Pop. TRENT, over the years, has performed more than 7,500 shows worldwide! John Stuart brought TRENT to Vegas in 1990 to do "Legends in Concert" with a four-year run. TRENT went on to headline his own shows all over the world. TRENT has performed 2,174 shows on the same stage as Elvis at the Hilton/LVH/Westgate!!! TRENT has been the longest running show at the Hilton/LVH/Westgate Casino & Resort.